Heyyyy! It seems like it's been forever since I published a post...Lots has been going on or you could say lack of! Lets just get right into it, you know those spaces where you have a vision, but either budget/space or both seem to get in the way? Ya, well our home office / DIY spot is like that!! It seriously bugs the crap out of me that it's usually in disarray & well the decor wasn't really speaking to me hahah! I ended up switching out some stuff like pictures, decor, & adding some neutral storage boxes etc..It feels so much brighter & the junk aka tools are hidden away in cute organizers!! This space gets used a lot so, I wanted to keep everything from my chalk paints for smaller projects to our personal paperwork organized!! 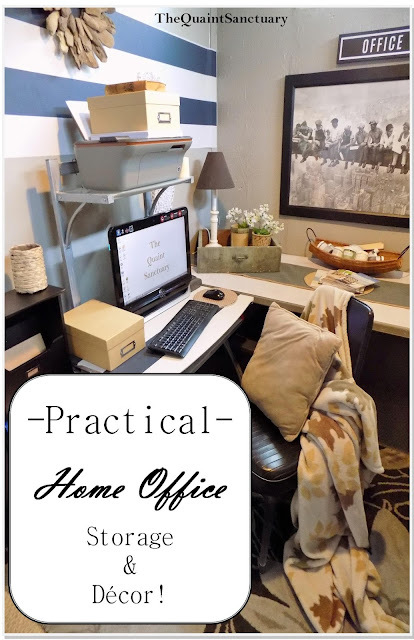 As with anything I blog this space was done on a practical budget with items from regular stores etc..I promise there are no $400 desk or $300 chairs..yet hehe just kidding!! I got these cute little neutral storage boxes for $4 at +Michaels Stores ! They're super cute, cheap &are pretty sturdy for the price actually!! Side Note: The polka-dotted mouse-pad was a DIY, I'll be blogging it soon hopefully!! I've always loved this picture. It was a gift from my aunt & uncle when we first moved into our condo years back!! I thought it looked cute hanging in the office with the "Office" sign from at +HomeGoods above it!! I mean how cool would that be to have your office hundreds of feet off the ground?! I hate heights, but love this vintage inspired picture!! Both the crocks are thrifts & I just added some cheapy flowers for the ambiance! The old vintage stamped drawer was a garbage find!! **The metal white flower wall organizer is from +HomeGoods as well as the driftwood wreath! I've been looking for a new office chair literally for months now!! I'm not paying $300 for a chair, so this garbage find one will work for now or until my back gives out eek! I'm thinking an +IKEA USA parsons chair for support, comfort & appeal! Guess I'm headed to their clearance area soon..
For smaller projects or when it's cold out, I use the office & work table to paint, diy etc..My paints are usually all over so this basket helps keep them organized & still visible as to what I have/need to replace! The basket was a hand-me-down! I really hope you guys got some rustic inspiration for your office or crafty space!! I know office accessories & furniture can be really expensive , so being able to share some simple/thrifty alternatives was a must!! Have a great week guys! !